When I was in Agra, people referred it as Lohri, back in Hubli it is referred to as Sankranti, and I have learned that there are a few other names in other parts of India such as Pongal and Sukarat. For me the festival started after our class finished our dinner at the lovely Clark Shiraz hotel in Agra. It was still early in the night, so me and my classmate Jen went to explore the hotel, starting at the outdoor pool. From the pool we spotted a large, well-constructed bonfire. We were kindly invited to join the people at the bonfire, who turned out to be a film production company on a company outing. Soon after we were all given popcorn and peanuts. As per tradition, we all danced around the fire and threw the food in. It was explained to me that this was an offering to the fire god to bring a good harvest for the next crop cycle. I found this to be such a very fun and festive tradition. The next day we left the hotel to begin our journey to Jaipur. Once we finally got to Jaipur I could see that festivities were far from over. 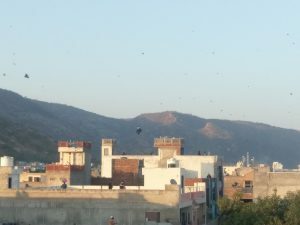 The holiday was being celebrated as a kite festival. We arrived at a jewelry store and after a quick visit went to the rooftop of the tall building. When I got to the top and took a look around I was amazed. Everywhere I looked there were people out on the rooftops flying kites. Thousands of kites filled the air from every direction. I had never seen anything like this before, I had not been used to such incredible participation in festivals, I feel like this sort of event would never have been possible back home in Mass. Even I tried flying a kite up on the rooftop, but without much success. Looks like I’ll need to get some practice before the next festival. We went back to the hotel after some time. After checking into our rooms and having dinner we decided to go explore the rooftop. Once we got there we could see that this amazing festival was not over yet. By now it was dark, and all the kites were now replaced by sky lanterns and fireworks from all directions. There were even more fireworks than when we had New Years in Hubli! I returned to the rooftop later in the night and got to see sky lanterns continue to pass over me. The whole festival experience was incredible. It was really one of the things I loved about India. Everyone getting together with friends and celebrating around a campfire, on the rooftop with kites, and even at night again with fireworks and lanterns, with your entire city participating right alongside you. I’m so grateful I was able to experience this festival during the trip. When I first heard that we were going to be leaving the scholar’s house at 6:30 a.m. for a field trip, I’ll admit I was less than excited. I didn’t know much about where we were going, only that it was some sort of large kitchen. 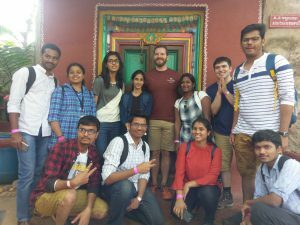 We travelled by bus and when we arrived we all removed our shoes and entered a large reception area where the tour guides began to explain the mission of Akshaya Patra. According to their presentation, many of India’s underprivileged children attended public government schools. These schools did not provide food to the children and many were unable to afford food of their own. This led to thousands of underprivileged children skipping out on school because they were too hungry, and as we know, education is one of the most effective ways to break a cycle of extreme poverty. This is what inspired the founders of Akshaya Patra, making sure that no child is deprived of education due to hunger. 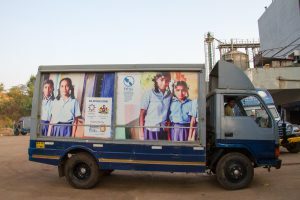 The Akshaya Patra foundation is a non-profit organization that is essentially a series of enormous kitchens that cook hot food for all the government schools in their surrounding area. For some of the children that attend these schools, this food will be the only thing they eat all day. Our tour began with the dry storage room. 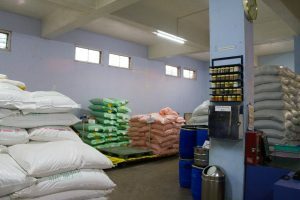 There was an impressive store of several tons of basic food ingredients. They then showed us a large device used to clean the rice. The guides explained that the government of India actually provided the rice to them for free, but it was the lowest quality of rice, and contained bits of metal and other impurities. But by the time the rice reached the end of the magnificent cleaning machine, it looked good as new. We got to see the top floor where the rice and vegetables were prepared for cooking. The entire room was filled with thick steam from the rice cooking below. One of the things that struck me most about this facility was how hygienic everything was. 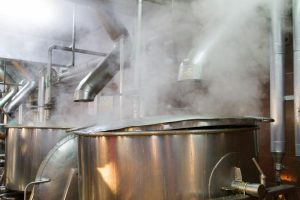 In this stage of the production all the rice was thoroughly washed and even the raw vegetables were rinsed in chlorinated water to ensure food safety. Not only were these people giving children a meal to eat, but one they knew would be safe and clean. Next, we got to go to the heart of the building, the kitchen. This Akshaya Patra kitchen in particular was known for being the largest kitchen in all of Asia. The room itself consisted of at least a dozen of industrial-scale pressure cookers. On one side of the huge room rice was being cooked, and on the other, was sambar. I was totally blown away just looking at the literal tons of rice being processed. As I watched the workers empty the cooked rice out of one of the cookers, it looked like each massive scoop could feed a family for a week. The kitchen was said to currently serve around 150,000 children in the area but had the capacity to serve up to 250,000. I thought this was very forward-thinking to have an operation like this be so scalable if the need should arise. After the kitchen we went outside to see the hundreds of trucks that took the food to schools all over the area in time for lunch. At the end of the tour they saved some rice and sambar for us to try. I have to say, I was VERY impressed! The food was delicious! Just goes to show you that food made with love tastes much better. One of my favorite weekend activities was our trip outside Hubli rural Karnataka. There we found the hidden gem, Rock Garden. All I had known about this place was that there was a mud bath, which had been previously discussed and I was strongly looking forward to. We arrived at first to a barren looking parking lot that was seemingly in the middle of nowhere. We then lined up in front of a cave and when we got through, I could tell there was much to see at this hidden park. First, we were greeted by dozens of statues of Karnataka’s own Rajkumar. Although I had never seen one of his movies, I could tell from the statues that he must have been a talented actor to play so many different roles. I soon found out that this Rock Garden parks claim to fame was having a world record for most cement statues. With that in mind, the detail and accuracy of the statues was quite impressive. I was reminded of the detailed wax figures I had seen at wax museums back home. After the beginning of the park which contained more famous figures of Karnataka. 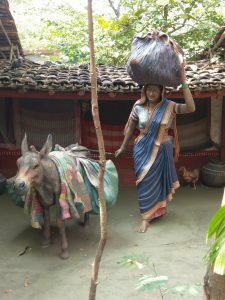 The park transitioned into statues and scenes that depicted traditional village life of Karnataka. This was my favorite part of the trip. 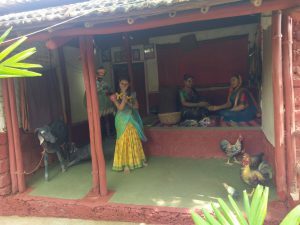 Since I had spent my whole trip in urban areas, I had little perspective on rural village life, and I wanted to see as much of India as I could. Granted I understand that much of what I saw would be a somewhat outdated view of what village life is like in the 21st century. But nonetheless it was a great learning experience. After hundreds of statues and a paddleboat ride, we finally arrived at the main event, the mud bath. I decided to get things started and jump in first. The cool mud felt very refreshing after spending the whole day in the sun. As we learned in one of our in-class videos, it only takes one person to start a movement. Soon after the first couple of us went to start playing in the mud, many others soon started to join us. 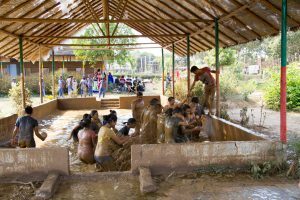 Each new person was welcomed with a typhoon of mud splashed from all sides. Soon almost our entire group was splashing around in the mud. Even people who originally said they wouldn’t participate in the mud bath eventually joined in. Except for all the dirt I got in my eyes, it was an incredibly fun experience. After we were done in the mud there was still more fun to be had. What better way to wash all that mud off than with a rain dance! By the time we were clean and tired from dancing, we all got changed and started heading back toward the bus. For us foreign students, even this was an exciting experience. The Rock Garden was being visited by hundreds of school children, and apparently, they find foreigners very interesting. As I walked back from the mud bath it was hard not to feel like a celebrity, dozens of children were running up to us asking what are names were and wanting to shake our hand. At points it actually got a bit hectic, but we all made it back okay. Rock Garden was the perfect Karnataka weekend trip and I would be happy to go back.